Clean prawns in water. Remove the heads and shells but leave intact a small part of the shell near the tail. Remove the shell cover of the frontal part of the tails. Place each prawn on a cutting board and make a shallow cut down the bakc with a paring knife. Pick out its vein (or digestive tract), which resembles a thin black string. Make diagonal cuts along the inner side of each prawn to stretch it. Flatten the tail of each prawn on a cutting board and scrape off the dirt on the lower half of the tail with a knife. The dirt will pop out. Position each prawn flat on the table. Squeeze its side gently to straighten and lengthen its figure. Put about 1 cup of the flour in a bowl. Hold each prawn by the tail and roll in a bowl of flour. Set aside. Mix together just enough of the remaining flour with the ice cold water to produce a watery consistency. Add baking powder and cornstarch. (the cold water makes the batter swell and become puffy when it is fried in hot oil). Heat cooking oil in a large wok or deep fryer. Oil must be very hot. To test if the oil is hot enough, put in a small amount of batter in the oil. If the batter floats, then the oil is ready. Holding it by its tail, dip each floured prawn in the batter. While astill holding each prawn by the tail, position it gently in heated oil. Deep fry until golden yellow and crisp. Remove prawns from oil and drain on paper towels or wire rack. Serve the prawns with the dip. 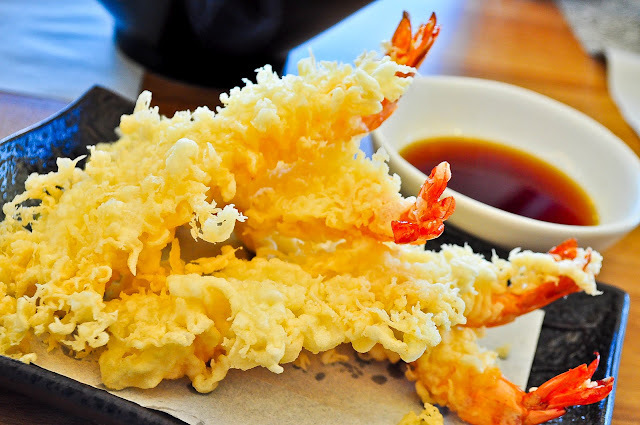 If you wish you may use the same procedure for cooking vegetable tempura. Just slice carrots, bell peppers, sweet potatoes and eggplants into servign pieces. Dredge vegetables in flour, dip in batter and deep fry as above.